Stay on top of your holdings, open your Smart Portfolio today! With TipRanks Daily Insider Transactions, users can track the very latest transactions from a vast database of over 36,000 corporate insiders. Powerful NLP algorithms monitor the insiders and rank them so that users know which insiders to follow to outsmart the market and maximize their own investment returns. TipRanks formulas enable users to filter for only informative transactions which provide a glimpse into the insider mindset and ultimately into the real outlook of the company. Most published content fails to differentiate between these informative transactions and uninformative transactions. Now let’s see how you can use the Daily Insider Transactions tool to find a good investment. 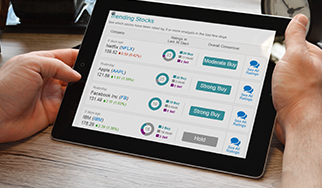 Begin by filtering from thousands of possibilities to only the best picks that meet your investment criteria. 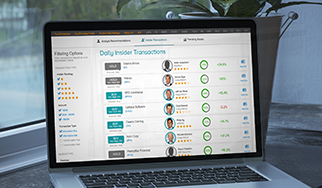 By selecting only four- and five-star ranked insiders, you can see the most recent transactions by insiders that consistently generate positive returns. Select the type of insider you are most interested in- office, director, owner or other. 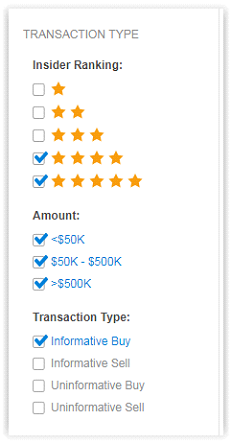 Next choose the transaction sector, amount and type -buy/ sell, uninformative/ informative. Uninformative transactions indicate that an Insider is buying/selling shares for reasons that do not necessarily indicate confidence in the company. For example, an Uninformative Buy in insider trading can be an insider who is given shares as a form of compensation. Informative Buy/Sell transactions are deliberately made by Insiders, thus donning a vote of confidence in the company. Finally adjust the transaction benchmark and time period to rank the insiders in the most accurate way for your investment strategy. Short term investors can measure the insider according to a transaction time period of one month, longer term investors may prefer a one or two-year time period. The result: we can see info on all the insider transactions that fit your criteria- the company name, the type of transaction, the date and the transaction amount. Purple for sell, green for buy. 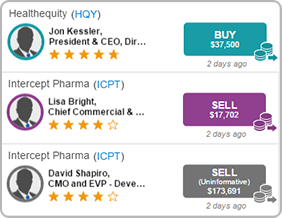 For example, as the screenshot above shows, at the time of writing five-star President and CEO Jon Kessler has just made an informative buy of shares worth $37,500 in Healthequity (HQY). The insider name, position and rating are also displayed so you can see at a glance if that insider is of interest to you. Click on the company or the inside name to explore further. Also note that you can access the actual SEC filing of the transaction by clicking on the small button on the right. And that’s it! Happy investing! Have a question about the Daily Insider Activity Tool? Thank you for submitting your question. TipRanks support representative will shortly contact you.